This map shows where we are with respect to the cities of Nice (upper right), Antibes and Cannes (along the sea shore) and Grasse (upper left). 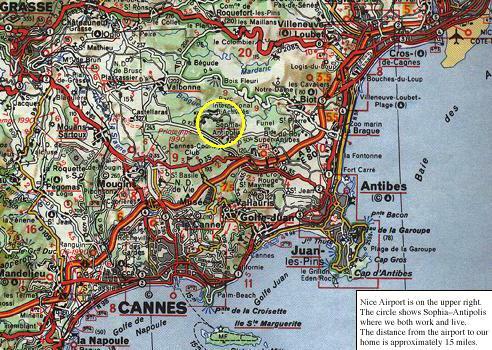 The area circled in yellow is part of the Parc de Sophia-Antipolis, the European Silicon Valley. Since we live and work there, the kids can walk to school and Vicki and Daniel can walk to work. The best source of general information for the whole area is Nice Matin, the newspaper that serves the entire French Riviera. The area features spectacular weather (more than 300 days of sunshine per year), beautiful scenery from seashore to snow-capped mountains, and many gorgeous old villages.